Dwayne Johnson is the king of big-budget action spectacles. He has achieved the trifecta.Skyscraper is a worthy successor to Jumanji: Welcome to the Jungle and Rampage. While the film is completely different thematically, it has the same popcorn cinema elements that are so damned entertaining. I must admit to being underwhelmed by Skyscraper's marketing campaign. The poster of him leaping from the crane into the building was laughable. Thankfully, the movie is not. Skyscraper is a disaster thrill ride that's infectiously gripping. Skyscraper takes place in Hong Kong. A Chinese billionaire, Zhao (Chin Han), is on the verge of opening the world's tallest building; a glittering glass and steel behemoth called The Pearl. Dwayne Johnson stars as Will Sawyer, a former FBI agent turned security consultant; who lost a leg in the line of duty. Sawyer's job is to inspect The Pearl for insurance companies. Zhao has allowed Sawyer's wife (Neve Campbell) and children to stay in a luxury suite during the process. Just as the building is about to be certified, a sophisticated group of terrorists attack. The building's safety systems are crippled. The Pearl is set ablaze. Sawyer must rescue his family, while repelling the bad guys and uncovering their true intentions. Skyscraper is not quite Die Hard meets The Towering Inferno. That's too easy a categorization. Sawyer engages in gunplay, but isn't shredding bad guys and dropping f-bombs like John McClane. This adventure is deadly, but firmly in the PG-13 realm. Sawyer's mission is frenetic and harrowing. He has to get into The Pearl after the fire. Then survive by his wits and trusty prosthetic leg. It isn't an Uzi, but just as helpful. Meanwhile, his family is running for their lives while being chased by Eurotrash bad guys. It's a cat and mouse game with a whole lot of fiery chaos raining down. Writer/director Rawson Marshall Thurber (We're the Millers, Central Intelligence) preys on instinctual fears. The dizzying heights and ravenous fire are frighteningly realistic. Thurber establishes tension early and skillfully keeps the blood racing throughout. Only in the end can the audience exhale. Granted, there has to be major suspension of disbelief. But that's the fun in a summer disaster flick. Skyscraper isn't quibbling about the details or logic. The film does not try to outsmart you. One aspect of Skyscraper does have unexpected humor. Chin Han, who plays Zhao, had the exact same role in The Dark Knight. In that film, the Chinese gangster - Lau, escapes Gotham City to a skyscraper in Hong Kong, only to be recaptured by Batman. I could almost imagine Batman swooping in to rescue the Sawyers and Zhao. A friend slyly commented that the police should have turned on the bat signal when the building catches fire. Chin Han is a fine actor with a long and varied career. It's just a bit funny to see him a decade later stuck in the same situation. I firmly understand that only nerds like myself will see this connection. 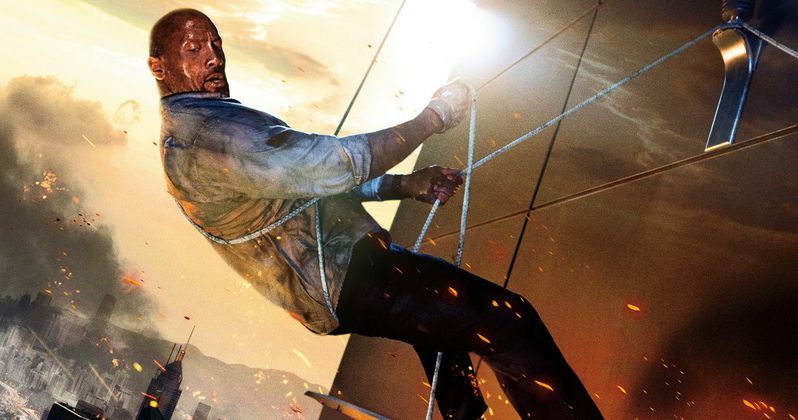 From Universal Pictures, Skyscraper is a vertigo inducing actioner for a global audience. The state of the art visual effects and production design sell the disaster gloriously. The big reveal won't blow your mind, but does fit neatly in the context of the story. Skyscraper will entertain as long as you accept the premise. Dwayne Johnson has another win at the box office.